This was my dessert for Easter this year and it was yummy. I have made this cake for years, but when it came down to making it this year, I couldn’t find my recipe. So I tried a new recipe from America’s Test Kitchen. This might be my new favorite, especially the frosting. It isn’t as sweet as the normal cream cheese frosting. Preheat oven to 350 degrees. Spray a 9′ x 13′ cake pan with nonstick cooking spray. In bowl of mixer, beat both sugars and eggs on medium-high until thoroughly combined, about 45 seconds. Reduce speed to low; with mixer running, add oil in slow, steady stream. When all is incorporated, increase speed to high and mix until mixture is light in color and well emulsified, about 45 seconds to 1 minute longer. 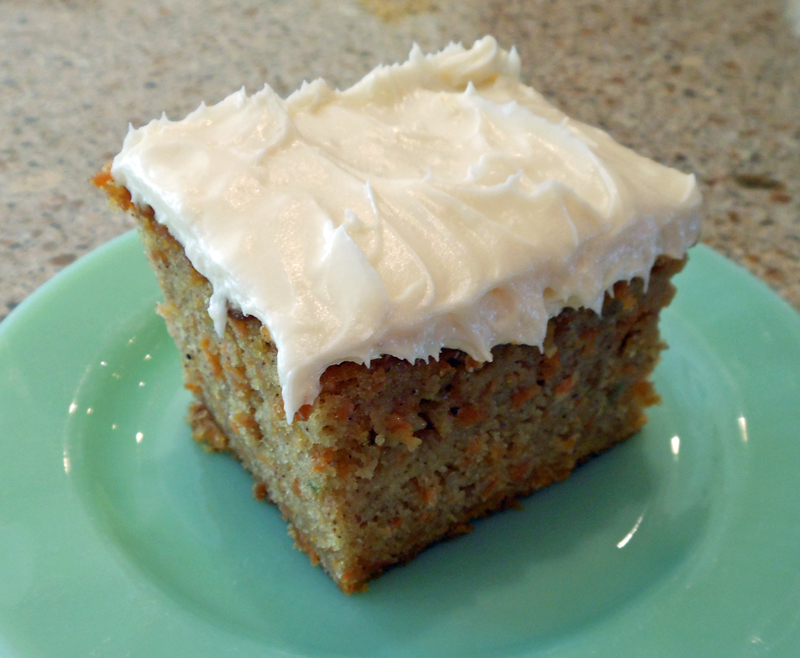 Turn off mixer and stir in carrots and dry ingredients by hand until incorporated and no streaks of flour remain. Pour into prepared pan and bake until toothpick or skewer inserted into center of cake comes out clean, 35 to 40 minutes, rotating pan halfway through baking time. Cool cake to room temperature in pan on wire rack, about 2 hours. When cake is cool, mix cream cheese, butter, sour cream, and vanilla at medium high speed in clean bowl of mixer fitted with whisk attachment until well combined, about 30 seconds, scraping down bowl with rubber spatula as needed. Add confectioners’ sugar and mix until very fluffy, about 1 minute. Note: If you like nuts in your cake, stir 1 1/2 cups toasted chopped pecans or walnuts into the batter along with the carrots. Raisins are also a good addition; 1 cup can be added along with the carrots. If you add both nuts and raisins, the cake with need an additional 10 to 12 minutes in the oven.